Check out Tobi's Be On My Side Lace Up Sweater When your weekends could do with some attitude, slip on the Olive Be On My Side Lace Up Sweater. This v neck sweater has a lace up tie at the neck, with a deep ribbed hem and cuffs and contrast stitch raglan shoulders. Side slits add an edge to this off-duty Fall sweater. 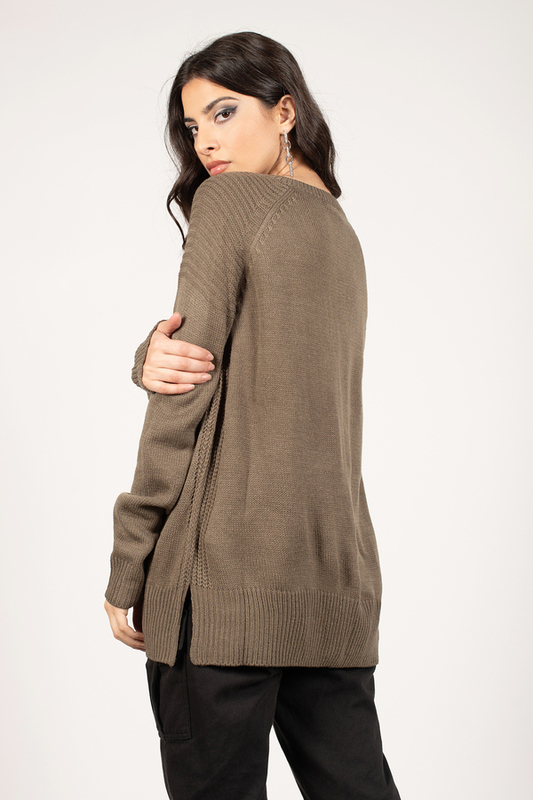 When your weekends could do with some attitude, slip on the Olive Be On My Side Lace Up Sweater. This v neck sweater has a lace up tie at the neck, with a deep ribbed hem and cuffs and contrast stitch raglan shoulders. Side slits add an edge to this off-duty Fall sweater. When your weekends could do with some attitude, slip on the Toast Be On My Side Lace Up Sweater. This v neck sweater has a lace up tie at the neck, with a deep ribbed hem and cuffs and contrast stitch raglan shoulders. Side slits add an edge to this off-duty Fall sweater. When your weekends could do with some attitude, slip on the Black Be On My Side Lace Up Sweater. This v neck sweater has a lace up tie at the neck, with a deep ribbed hem and cuffs and contrast stitch raglan shoulders. Side slits add an edge to this off-duty Fall sweater. When your weekends could do with some attitude, slip on the Vintage Blue Be On My Side Lace Up Sweater. This v neck sweater has a lace up tie at the neck, with a deep ribbed hem and cuffs and contrast stitch raglan shoulders. Side slits add an edge to this off-duty Fall sweater. Olive, Vintage Blue modeled on a size Small.